The diverse talents and abilities of THE BEACH BOYZ have combined to form a totally live musical experience (no electronic “sequencing” is used) that brings to life the sights and sounds of the legendary Beach Boys. Virtually every chart hit the Beach Boys recorded is accurately reproduced by THE BEACH BOYZ. The group formed in early 1999 when Jon Callander, Richard Smith, Lee Carroll, and Paul Keys assembled to create the award winning Beached Boys Tribute Show on Queensland’s Gold Coast. The result, a mix of sharp instrumental and tight vocal harmonies produced a sound the Beach Boys official web site described as the best Beach Boys Tribute Show in the world. 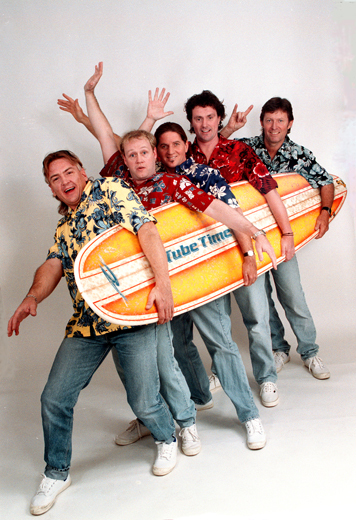 Winners of the prestigious “Best Concept Show” at the Wintersun Awards Ceremony in 2001, THE BEACH BOYZ ability to create a stunning visual and audible performance has led to sell out shows across Queensland and NSW. The band have performed at many exclusive venues such as Hayman Island, Sanctuary Cove, the Five Star hotels of the Gold and Sunshine Coast, Casinos, and Festivals. THE BEACH BOYZ can tailor their shows to meet the requirements of virtually any venue including corporate or private events and functions. The Beach Boyz play all the hits of their namesakes, taking the audience through a brilliant timewarp, and back to the Beaches.